Tell Me Again is a group exhibition at Dalston Lane’s Invisible Line Gallery showcasing the work of contemporary local artists Elizabeth Eamer, Sarah Jacobs, Francisco Ortega and Cristina Rodrigues. Despite the intimacy of the gallery space, the four artists’ work is spread out and accessible with no sense of crampedness or overcrowding. Aghdashloo found curating the show a challenge because she had to find works that complemented each other without repeating or dominating. The stand out piece is Spanish artist Francisco Ortega’s Pressure Release Valve. Chaotic yet measured, the painting is contradictory, conflicted and well-balanced. Ortega’s work is worth exploring further. Cristina Rodrigues’ blanket installation almost consumes the entire gallery space and is impressive in its scale and craft. 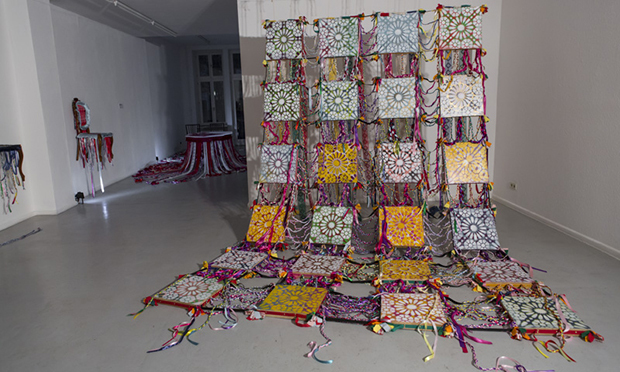 Constructed out of 24 colourful, wooden tiles, joined by strips of fabric, the blanket is hung from the ceiling and drapes gracefully across the floor. It is a mesmerising piece, full of confidence and contains Iranian as well as Portuguese influences. To the left of it lies a series of circular wooden panels by Sarah Jacobs. The size of Rodrigues’ installation means these circular panels can easily be missed. Although not as conspicuous as other works on display, there is a controlled, philosophical nature at play and there is a great deal of vibrancy in her meticulous acrylic-on-wood paintings. Elizabeth Eamer’s paintings demonstrate a similar degree of control and geometrical experimentation. Tell Me Again is a well-curated show bringing together a variety of styles and approaches with the best pieces (such as Ortega’s large-scale painting) worth making the trip to the Dalston Lane gallery alone.